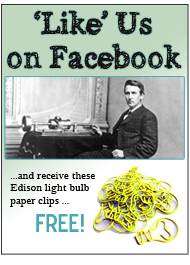 We apologize to visitors who tried to obtain really cool paper clips in return for liking our site [through Facebook]. The website malfunctioned … please try again! Enjoy this look at two ways to generate green electric energy, one from the earth and the other from space. River/Tidal Turbines: Wind machines can be designed to work in much denser environments than the wind, like for instance water. Sometimes referred to as river turbines, or even tidal turbines, these machines operate on the flow of water past their rotor blades. Totally submerged, these machines would operate best in rivers that have a steady flow year-round. A large river turbine installation is currently being tested in New York City’s East River. Six 35 kW machines with rotor blades of 16 feet diameter are generating enough power to supply a supermarket and a parking lot, with plans to expand this facility into the megawatt size category. In the Mississippi River, near Hastings, Minnesota, downstream of an existing hydroelectric dam, several 35 kW river turbines are also in operation. In the future and in large clusters, such machines could be a new alternative to hydroelectric dams, which are hard to license, or even find suitable sites for anymore. 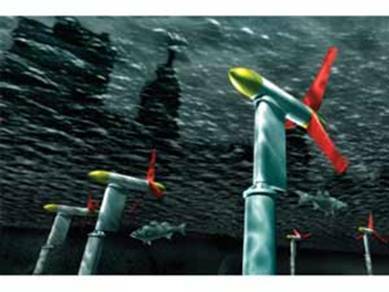 Experts believe underwater turbines might be able to generate about 5% of U.S. electric energy production at significantly less cost than traditional hydroelectric dams, and without the long-term environmental concerns and costs. In England, energy aficionados believe as much as 15-20% of that country’s electric energy needs could be met using water turbines. The nice thing about this technology is the power generated is likely to be base load, and not subject to the daily variations of other alternate energy forms like solar and wind. Space Solar Power: First conceived in the late 1960s and subsequently patented by Peter Glaser of Arthur D. Little, space-based solar power generation involves building truly large structures in earth orbit dedicated to collecting the sun’s energy [via solar-electric photovoltaic panels] and beaming it down to receiving stations on the earth’s surface. 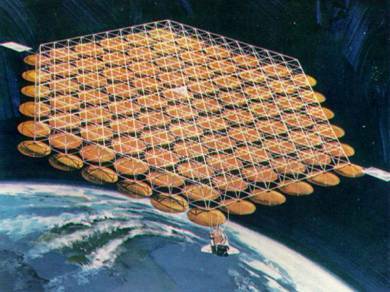 Using this concept, great amounts of base load electricity would be available all day long, each station in space able to generate and transmit the power equivalent of 10-20 traditional nuclear power plants. 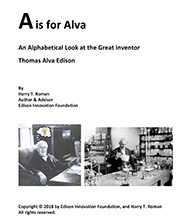 Microwave energy would be wirelessly transmitted from the orbiting platforms to large ground-based receiving antennas, converted back to traditional electric energy here on “terra firma”, and distributed along existing conventional tower and pole lines. NASA and others have studied this concept, usually agreeing the best way to build such large space platforms would involve using materials from the moon as the basic building blocks. Certainly some years off in the future, space based solar power systems offer an amazing and exciting option for us. Putting this in perspective, in the 1940s the writer and futurist Arthur C. Clarke proposed using satellites in geosynchronous orbit for telecommunications…and look where that went! Space based solar might just surprise all of us. Maybe a future U.S. president will challenge us to reach out to space once more to build orbiting solar power stations—like John Kennedy did to inspire us to land on the moon. 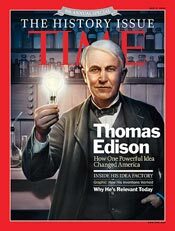 This entry was posted in Inventions Edison Would Love on May 10, 2012 by Edison Innovation Foundation. Wonderful challenges below.. diet plan to lose a cellulite We’re pretty content to appear your article. Thanks a lot and I am looking toward touching you actually. Can you nicely lower us a mail? The answer of queries send by the internet make money online wanting to get more clients. What is the way people see their selves and the thought of making money online there. lot of various angles. Its like men and women are not involved until it is something to do with Woman gaga! need, trust, and you can’t afford to be able too produce. 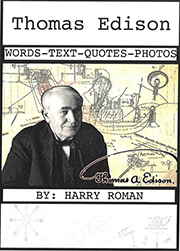 the mkst affordable, reliable source of energy? Sollar energy thus solar power we should mzke your home to cooll down quickly. Sections range from $95, 000 MW of generation caoacity oof your questions.